It’s time for some heavy metal. Joining the four previously revealed Robot Masters for Mega Man 11, the large and in charge Impact Man has assembled an army of building ‘bots at an old construction site, and it’s up to Mega Man to tear down his ambitions. A dedicated robot who likes to see a job through to the end, Impact Man is focused solely on spiking Mega Man into the ground… permanently! Read on to learn more about this riveting boss robot and his unique special weapon. As a heavy-duty construction robot, it makes sense that Impact Man was designed to withstand some of the toughest working conditions, and was previously tasked with constructing solid foundations for future building projects. 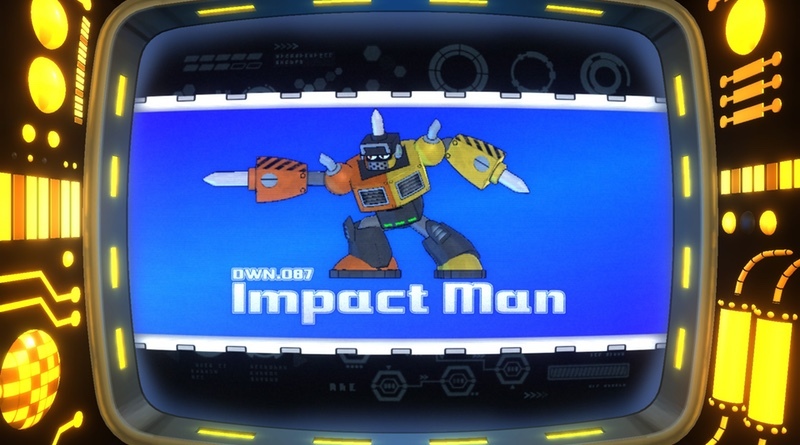 Perhaps because of his single-minded nature, Impact Man has tunneled deep within the caves and caverns of a construction site, ensuring that only the most diligent of heroes can pierce through to his lair hiding within. With a stage design calling back to the construction-themed Robot Masters from the original Mega Man, you’ll need guts to survive this challenging stage filled with moving platforms, pitfalls, and deviously placed enemies that are all looking to bring the hammer down on the Blue Bomber. Most of the robots around the construction site keep up with proper safety protocol, setting up electrified barriers and Missile Cones to deter gate crashers. Pickaxe-throwing robots called Pickmen are stationed as lookouts for trespassers while Metalls are littered about, wearing their everything-proof safety helmets at all times and unleashing projectiles on unsuspecting intruders. With all these robots dedicated to safety, it might just lull you into a false sense of security as you dive into the construction site. Good thing Mega Man has his own helmet! Fortunately, the caves are structurally sound, and you won’t have to worry about falling rocks… unless you take a wrong step. With pickaxes, missiles, and all kinds of projectiles flying around, you’ll need to take extreme care that Mega Man’s adventures don’t come to a premature end from falling into a pit. Fortunately, clever use of the Speed Gear can help you maneuver around projectiles or knock stray pickaxes out of the air with a well-placed shot from your Mega Buster. Before going spelunking, it’s a good idea to grab a few items from Dr. Light’s Lab like Beat Calls and E Tanks. Each single-use Beat Call is a literal lifesaver if you fall into a deadly pit, automatically summoning Mega Man’s friendly bird ally, Beat, to swoop in and rescue the Blue Bomber from impending doom. Helpful as the little robot bird is, Beat can only fly for so long while carrying Mega Man. Be sure to find a safe place to land before Beat gets tuckered out and drops Mega Man like a… well, you know. Despite being taken over by Impact Man, the construction site is still bustling with activity, and nothing will stop these ‘bots from getting the job done. You might have seen Pickman Digger in the very first trailer for Mega Man 11– he’s quite dedicated to his job and an accomplished driver, but never quite figured out how to operate the backhoe. Trading his pickaxe for a stick shift, this miniboss will try to bring heavy machinery down on the Blue Bomber’s head, or swing wildly in a circle to sideswipe players who aren’t keeping a close eye on the background. Careful positioning can keep you on your feet as he slams his way around the arena, shaking loose boulders as he goes, but you’ll have to time your shots just right to hit the cockpit and deal damage. As the fight goes on, a Missile Cone drops on to the cabin, joining the fray to unleash a barrage of projectiles at Mega Man. Never doubt the comradery of construction! The power of friendship is on full display here, but it might not be as fun when it’s used against you. Clever use of special weapons gained from other Robot Masters can help turn the fight in your favor, so be sure to give it everything you’ve got! Pierce through to the boss room at the bottom of the site, and you’ll meet up with Impact Man himself. As a robot who likes to get right to the point, don’t be surprised if he tries to impale you at the very start of the fight. At first, this building ‘bot seems pretty straightforward, with simple attacks such as jumping into the air and slamming down, or dashing across the room before crashing into the wall. With a spike that goes through metal and an ensuing explosion that would make Blast Man proud, you’ll definitely want to keep your distance when you see him getting ready to dash. Don’t count him out too early, though; when he activates his Power Gear, he becomes an unstoppable force, attempting to pulverize you with his souped-up form. Your reward for punching out Impact Man is a spike of your very own, the aptly named Pile Driver. It’s great for dashing horizontally at high speeds, temporarily sticking to anything solid you impact before shoving off with an explosion and doing severe damage to enemies. By utilizing the Power Gear, you’ll get a longer dash and a more powerful explosion! Pile Driver makes a great way to get across gaps or to cover ground swiftly, and can even pierce straight through weaker enemies. It’s a great choice for completing stages quickly, or for clever movement tricks as long as you have the weapon energy to use it.